State TV Complains Other Networks Aren't Covering Caravan, Then Announces Troops Are Coming Home - Joe.My.God. Citing a report by conservative media watchdog Media Research Center, Ainsley Earhardt noted that NBC and ABC spent zero seconds covering the caravan, while CBS dedicated a mere 21 seconds to a story Fox News has provided voluminous coverage. 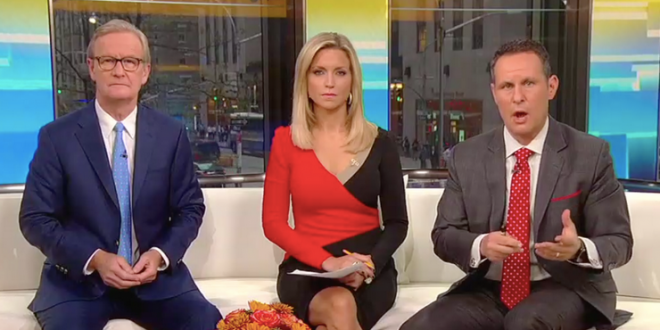 In the next breath, co-host Brian Kilmeade reported an update in the caravan story: that the U.S. military deployed to the southern border to prevent this alleged “invasion” had completed their mission and would be returning home by December 15th. I’d post video of the above but Fox News hasn’t tweeted since November 8th.